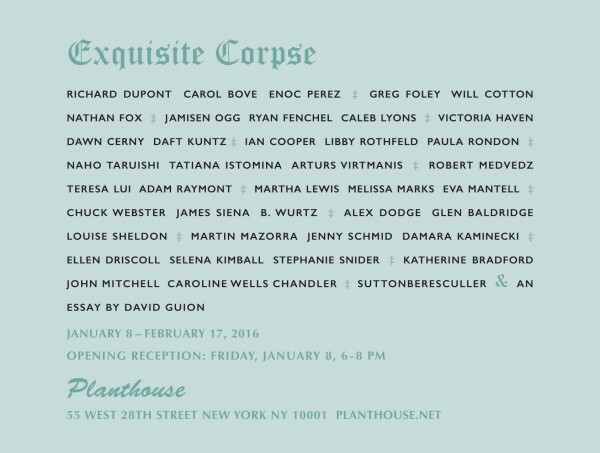 Planthouse Gallery is pleased to present its upcoming group exhibition, Exquisite Corpse, an artful modern day collage of ‘pictorial consequences’, which accompanies the release of its first children’s book publication, 43 Monsters. 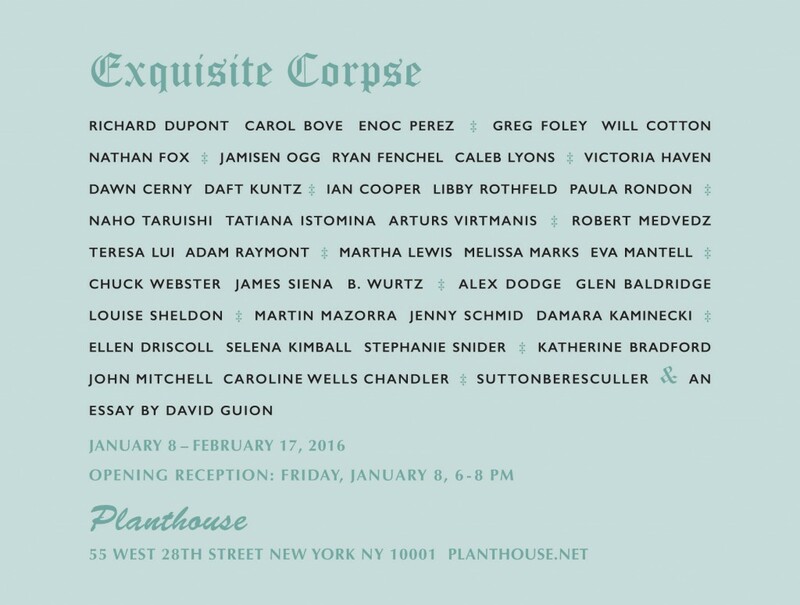 Please join us for the opening reception on Friday, January 8th. The Exquisite Corpse, derived from the French expression “Le cadavre exquis boira le vin nouveau” (or, “the exquisite corpse shall now drink the new wine”) is an exercise in improvisational intrigue that has challenged the agendas of artists since it was purportedly invented by André Breton and his Surrealist companions as a parlor game in the early th century. Traditionally, the Exquisite Corpse involves a rotating piece in poetic or visual form that is initiated by one artist, then continued by another, and finished by a third. The limitation of the ‘game’ is that the successive artists see only a fragment of the previous drawing upon which to elaborate, thus resulting in a playful, imaginative, and surprising image that is more than the sum of its parts. For our version of this experiment, we’ve invited  Planthouse veterans and friends to partner with artists and media of their choosing. The collective collaborations complete — along an essay by Night at the Museum and Dinner for Schmucks screen- writer David Guion—the veritable  ‘monsters’. Planthouse is delighted to manifest our own uncer- tain iteration of this game in homage to the cheeky humor of our new book 43 Monsters, which features the whimsical 1970’s childhood illustrations of Chuck Webster and a comic text by Arthur Bradford. Richard Dupont, Carol Bove, Enoc Perez, Greg Foley, Will Cotton, Nathan Fox, Jamisen Ogg, Ryan Fenchel, Caleb Lyons, Victoria Haven, Dawn Cerny, Daft Kuntz, Ian Cooper, Libby Rothfeld, Paula Rondon, Naho Taruishi, Tatiana Istomina, Arturs Virtmanis, Robert Medvedz, Teresa Lui, Adam Raymont, Martha Lewis, Melissa Marks, Eva Mantell, Chuck Webster, James Siena, B. Wurtz, Alex Dodge, Glen Baldridge, Louise Sheldon, Martin Mazorra, Jenny Schmid, Damara Kaminecki, Ellen Driscoll, Selena Kimball, Stephanie Snider, Katherine Bradford, John Mitchell, Caroline Wells Chandler, SuttonBeresCuller, and David Guion.